Interagency collaboration has been repeatedly cited as one of the most important strategies in helping youth with disabilities move successfully from school into employment and adult life. However, often the primary focus of the collaboration and planning between school personnel and community service providers has been on disability-specific services and not on other, more generically available programs and services. The passage of the Workforce Investment Act (WIA) of 1998 offers new options and opportunities for youth in transition. WIA has challenged communities to create opportunities for all youth that moved beyond traditional vocational rehabilitation and related services. 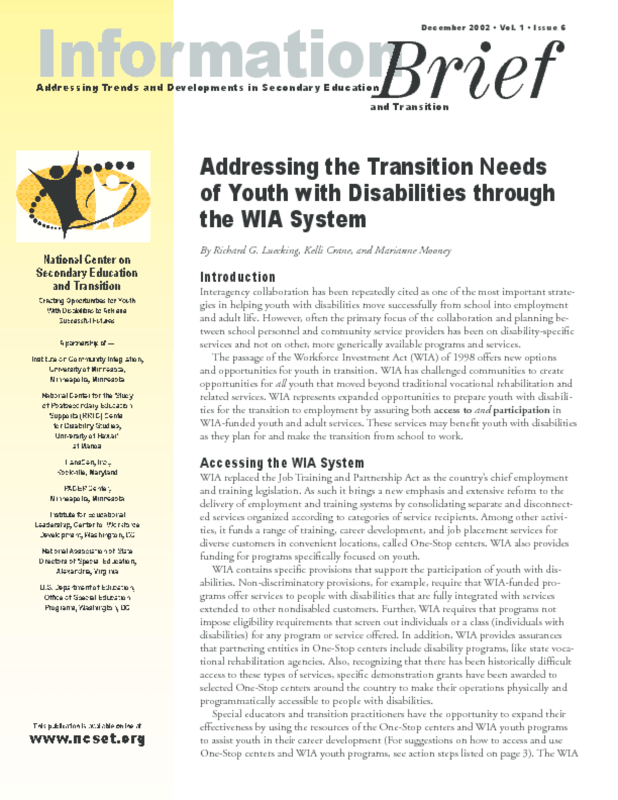 WIA represents expanded opportunities to prepare youth with disabilities for the transition to employment by assuring both access to and participation in WIA-funded youth and adult services. These services may benefit youth with disabilities as they plan for and make the transition from school to work.